My passion for massage started 10 years ago during my yoga practice. The connection between yoga and massage led me to read books and research more about massage and of how much that can heal the human body. I have been studying and researching about massage every since but jumped into a real massage journey taking my studies to another level early this year. 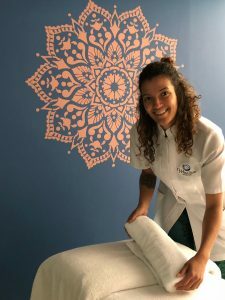 I absolutely love taking care of people and help them to perform in their full capacity reducing muscle pain and, educating my clients to live a healthy lifestyle. According to my perception, massage it's not a self indulgence, it is a self preservation!